Mars thinks about removing its candies from Frankendesserts; Prince William appears on cover of U.K. LGBT magazine; Clinton wins D.C. primary; Johnson Publishing sells Ebony, Jet; Twitter invests $70 million in SoundCloud. M&Ms-maker Mars Inc. is thinking about pulling its candies from desserts featured at fast-food chains. 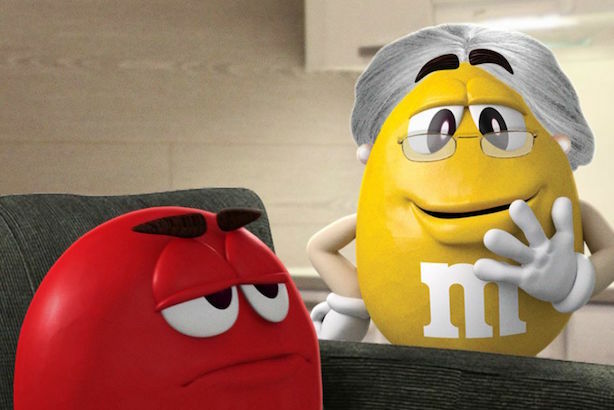 (Image via M&Ms' Facebook page). M&Ms maker Mars Inc. is thinking about pulling its candies from dessert items such as the McDonald’s McFlurry. The company is concerned that combo desserts, also featured at chains such as Burger King and Dairy Queen, have more than a day’s worth of sugar and conflict with its position that its products should be eaten in moderation, according to Reuters. Prince William sat for a cover shoot and interview with a leading U.K. LGBT magazine, Attitude, making him the first member of Britain’s royal family to do so. The issue will be published on Thursday, less than a week after the mass shooting at the Pulse nightclub in Orlando, Florida. Prince William encouraged readers to "be proud of who you are" and took a stand against bullying in the interview, according to BuzzFeed. Hillary Clinton won the Washington, D.C., Democratic primary on Tuesday and met with rival Bernie Sanders last night. The two camps released similar statements after the sit-down, pledging to defeat Donald Trump in November but with no endorsement or concession from the Vermont senator. Trump, at a North Carolina rally on Tuesday evening, rallied the crowd by thundering about banning The Washington Post from his campaign events. Johnson Publishing is selling Ebony magazine and online-only outlet Jet to Clear View Group, an Austin, Texas-based private equity firm. Ebony’s photo archives are still for sale. More recently challenged by economic trends battering the entire media industry, Ebony made its mark chronicling the Civil Rights movement in the 1960s. The magazine will keep its business office in Chicago and editorial footprint in New York City. Twitter is investing $70 million in SoundCloud, the music streaming service that it considered purchasing in full a few years ago. Twitter CEO Jack Dorsey confirmed the deal to Recode, saying, "They've been great partners of ours over the years and their community-supported approach mirrors ours in many ways." What to know on Wednesday morning: Facebook makes its suicide-prevention tool widely available. Gawker story on Trump’s hair draws lawsuit threat. Obama on gender equality: some workplace policies are "straight out of Mad Men." JetBlue offers families of Pulse nightclub shooting victims free flights.